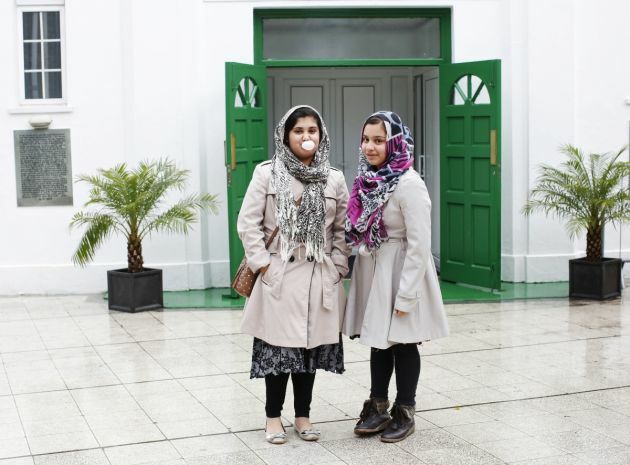 (Photo: REUTERS / Olivia Harris)Madiha, 12, and Afsha, 11, pose for a picture outside London Mosque in west London November 1, 2013. Madiha and Afsha started to wear the hijab around the age of 8. They wear the hijab for religious observance, modesty and to protect themselves. Reuters photographer Olivia Harris took portraits of a range of Muslim women in Britain and asked them why they chose to wear a hijab or veil. New research suggests that Islam will be an even more significant part of religion in Britain in the future and that churches for black migrants are thriving while traditional churches with a mainly white base are on the decline. "The future of religion in Britain is to be found in Islam and the black majority churches," says Professor David Voas, who specialises in population studies at Essex University and is an expert on religious trends. "Muslims already contribute ten per cent of British births; within several decades people of Muslim heritage will form 10 percent of the population, even if immigration came to an abrupt halt tomorrow. "If even half are observant, they will form a substantial proportion of the religiously active population. Ethnic minority Christians will have another large share," says Voas. Professor Voas discusses the latest trends in a blog for the thinktank Theos. "While the secularisation of consciousness in the West is an ongoing process, the secularisation of behaviour has reached the point of no return," he writes. He notes that the leaders of the major Christian denominations are asking the wrong question asserting that the issue is not why people are staying away from church but why anyone would go to church. "The onus is on churches to offer something that people want and would have difficulty finding anywhere else." He says the leaders of the major Christian denominations are asking the wrong question. The issue is not why people are staying away from church but why anyone would go to church.